Plants have developed certain adaptive responses to environmental stresses that cause adverse effects on growth. To identify genes involved in the adaptive mechanisms, we constructed a large population of transgenic Arabidopsis expressing rice full-length cDNAs, and performed gain-of-function screening under high-salinity stress. In this study, we identified a rice R2R3-type MYB transcription factor gene, JAmyb, as a gene whose overexpression causes tolerance to high salinity. 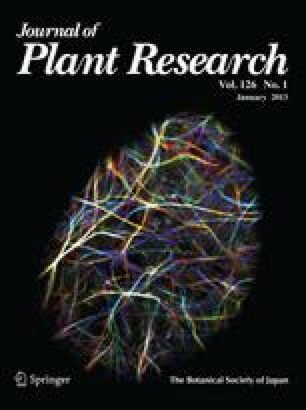 JAmyb overexpression in transgenic Arabidopsis improved tolerance to high-salinity stress during seed germination, seedling growth, and root elongation. In rice seedlings, JAmyb expression was induced by high-salinity and high-osmotic stresses and reactive oxygen species (ROS), suggesting that JAmyb is responsible for abiotic stress response. Microarray analysis showed that the overexpression of JAmyb stimulates the expression of several defense-associated genes, some of which have been predicted to be involved in osmotic adjustment, ROS removal, and ion homeostasis. Several transcription factors involved in the jasmonate (JA)-mediated stress response are also regulated by JAmyb. JAmyb has been reported to be associated with disease response. Our observations suggest that JAmyb plays a role in JA-mediated abiotic stress response in addition to biotic stress response in rice. We thank Dr M. Mori (National Institute of Agrobiological Sciences) for providing the rice seeds. This work was supported in part by Special Coordination Funds for Promoting Science and Technology (Science and Technology Agency of Japan).